Another FOSDEM is history. 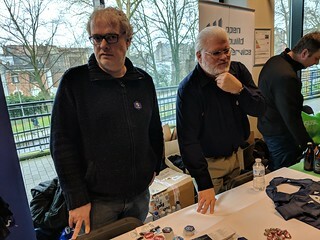 I wanted to take a moment to thank all of the people that helped out at the CentOS table at FOSDEM, as well as at the Dojo before FOSDEM. We had about 75 people in attendance at the Dojo on Friday, with 12 presentations from various speakers. Some of these presentations are already available on YouTube, with the rest coming over the next few days. 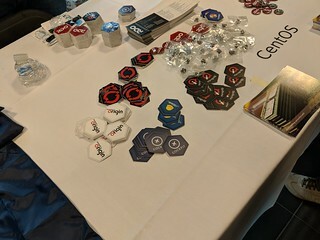 Traffic was steady at the CentOS table, from people new to Linux, all the way 15-year CentOS sysadmin veterans. A huge thank you to everyone who dropped by and chatted with us. If you missed FOSDEM and the Brussels Dojo, there's always other opportunities to meet CentOS people. This year we expect to have another 4 or 5 Dojos around the world, starting in Singapore next month, and moving on to Meyrin (Switzerland), Oak Ridge (USA), and Delhi (India). 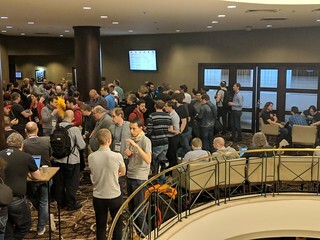 If you'd like to host a Dojo anywhere in the world, please get in touch with the Centos-Promo mailing list to see how we can help you achieve your goal. We can usually help find speakers, venues, and funding for your event.